We are getting down to the wire for class party planning. I was hoping to find a snowman version of Don't Eat Pete, but stumbled across this cute Winter Don't Eat Pete Game that I am using instead. Throw in a game of Roll A Snowman, a silent snowball fight and Winter 4 corners and I think I have the games covered. 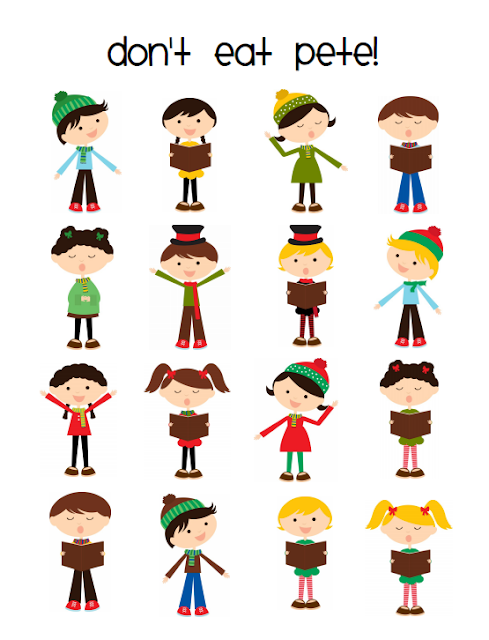 If you have a Kindergartner, you might want to check out the other free printable Kindergarten math games and Holiday phonics and fun games that are available over at Walking By The Way. How do you do a winter version of four corners? And what is a silent snowball fight? A silent snowball fight involves them all sitting on their desks and playing catch with five white foam (or styrofoam) balls. If you miss the ball or talk you are out and have to sit in your seat until the next round. It is really just quiet ball with a winter name. Winter four corners is just like regular four corners (one person is it and stands in the middle with their eyes closed. Everyone else quietly picks a corner and then the person in the middle selects a corner and everyone standing in that corner is out) but instead of numbering the corners they each are assigned a winter theme (mittens, scarf, ice skates, coat) and I just display a picture in each corner to remind them which corner is which.